The global composites market is anticipated to see high growth opportunities in the forthcoming years, as reported by Transparency Market Research (TMR). The market’s competitive landscape comprises of numerous large-scale players who hold substantial shares in the overall market. Yet, small-scale vendors are seen entering the global composites market in the coming years. 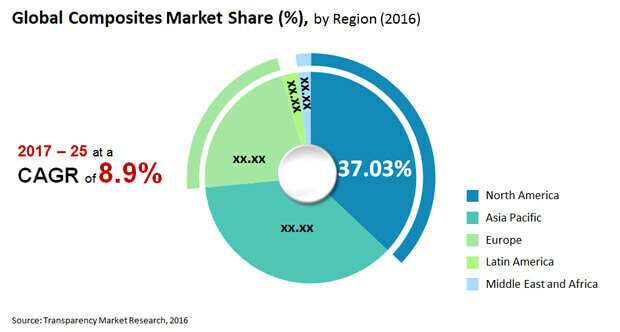 The market is expected to foster healthy competition among vendors in the global composites market in the coming years. Players operating in the global composites market are expected to engage in forward and backward integration activities. They are seen focusing on in-house production and catering of raw materials. Manufacturers are further seen investing in developing their unique manufacturing techniques. This is expected to give them a competitive advantage over others. Prominent vendors in the global composites market are KINECO, HITCO Carbon Composites, Inc., APPLIED POLERAMIC INC., Owens Corning, Toray Industries, and Teijin Limited. According to TMR predictions, the global composites market was estimated to be worth US$47.3 bn in 2016 and is likely to be worth US$102 bn by 2025. Over the forecast period of 2017 to 2025, the market is expected to rise at a 8.9% CAGR. Composites are utilized everywhere throughout the world to develop and fix a wide scope of foundation applications, from structures and scaffolds to streets and railroads. These applications last longer since they are high-quality, won't rust or consume, and give long haul opposition little upkeep required. In the course of recent years there has been a noteworthy improvements and advancements in the composites industry across different enterprises, for example, aviation, car, power, construction and others. Composite assume a key role in airplane industry and the ongoing move of avionic industry towards automated tape laying (ATL) and automated fiber placement (AFP) is expected to drive the market amid the gauge time frame. Organizations are constantly putting resources into enhancing and growing high quality regular filaments to enhance both mechanical and synthetic prerequisites. Also, the ongoing pattern on creating green materials would offer force to advancement of high quality regular fiber to build reception in the global composites market. Composites likewise give more prominent adaptability on the grounds that the material can be custom fitted to meet the plan prerequisites and in light of the fact that they offer critical weight preferences. With a high inclination for lightweight parts in vehicles, composites are being taken advantage of progressively by assembling organizations, in this manner filling in as a prime development driver for the market. This trademark is very liked to effectively control fuel discharges and enhance motor execution and upkeep.